New Hampshire has far fewer pedestrian fatalities than the national average. Though nearly 6,000 U.S. pedestrians were killed in 2017 and that number has been steadily climbing for more than a decade, preliminary data from the Governor’s Highway Safety Association (GHSA) showed just five New Hampshire pedestrian deaths in the first six months of the year. However, New Hampshire pedestrians are still at risk, and non-fatal pedestrian accidents can be serious. For every pedestrian killed in the United States, about 25 others are treated in hospital emergency departments. Often, these accidents result from negligence on the part of a driver, the pedestrian, or both. Distracted Driving: Looking away from the road for just a few seconds—the time it takes to read a text message or choose a new song—can mean traveling blind for hundreds of feet. That’s plenty of opportunity to miss a pedestrian stepping into the street or a child chasing a toy. Speeding and Driving Too Fast for Conditions: Driving too quickly obviously reduces the opportunity to see a pedestrian and respond by braking or changing lanes. But, that’s not the only reason driving too fast increases pedestrian risk. The faster a car is traveling, the greater the injury to the pedestrian is likely to be. Passing a Car Stopped at a Crosswalk: Crosswalks are intended to provide safe passage for pedestrians, but they only serve their purpose if driver’s respect that space. Going around a stopped vehicle may mean surprising a pedestrian who wasn’t visible from behind the car, and stopping in the crosswalk can force pedestrians into traffic paths. If you were injured by a motor vehicle, motorcyclist, or bicyclist while walking, you may be entitled to compensation for your injuries. Distracted walking is a growing problem in New Hampshire and around the country. In fact, the use of cell phones, portable music devices with headphones and other modern electronics has played a significant role in the rise of pedestrian fatalities. A pedestrian who was looking down at her phone as she stepped into the street or who failed to hear an oncoming car because an audio book playing through his ear buds blocked out the sound may be partially responsible for his or her own injury. However, that doesn’t necessarily mean that the injured pedestrian can’t recover damages. The state of New Hampshire employs a modified comparative negligence analysis. In simplest form, this means that an injured party whose negligence contributed to the incident may still recover damages unless his or her negligence was greater than that of all defendants combined. However, the compensation will be proportionate to responsibility. For example, if a pedestrian suffers damages in the amount of $200,000 but is found to have been 25% responsible for the incident, then recovery will be limited to 75% of total damages, or $150,000. No personal injury attorney can tell you exactly what you can expect to recover in the wake of a pedestrian accident, and you should be wary of any attorney who guarantees an outcome. However, a lawyer with experience in handling pedestrian accident cases and similar personal injury cases can assess the factors in your case and provide an educated assessment of its possible value. 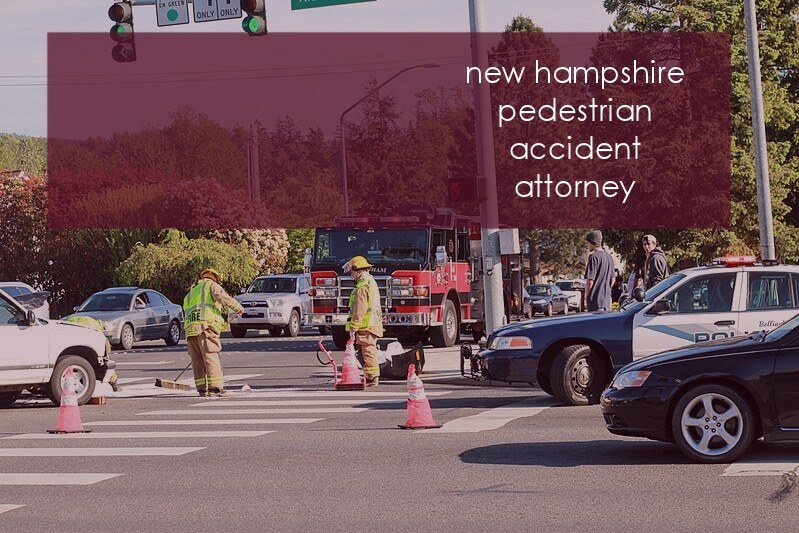 If you’ve been injured in a New Hampshire pedestrian accident, speak with a local personal injury attorney as soon as possible. The sooner you take advantage of the guidance a knowledgeable advocate can offer, the better positioned you’ll be to protect your claim. To learn more about your rights and options, contact attorney Kevin J. Broderick for a free consultation. Just call 978-459-3085 or fill out the contact form on this site.